Product #20880 | SKU SABL3VP | 5.0 (based on 1 rating) Thanks for your rating! 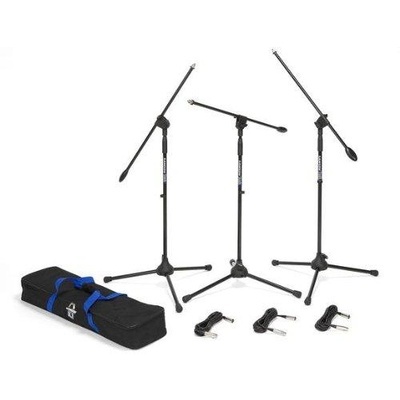 The Samson BL3 VP Boom Stand & Cable (3-Pack) is a convenient 3-pack of Samson's BL3 Ultra-Light Boom Stand plus three gold-plated 18' XLR cables. All of this is conveniently packaged in an easy-to-transport canvas carry bag. The BL3 features a die-cast and steel construction and sleek black finish. In addition to three BL3 stands, you also get three 18' XLR cables and easy to transport canvas carry bag.